Monday UPDATED UPDATE: Youch. Glancing at this past weekend's actuals, not a single flick crossed the $30M plateau, pathetic for the month of June. Everything changes this Friday with the return of the Autobots and Decepticons — will Transformers 4 be the first film of 2014 to serve up a $100M+ debut? See you Thursday. Sunday UPDATE: Weak weekend as expected with Think Like a Man Too squeaking past 22 Jump Street for the title as we await Monday's actuals. And as surmised here Thursday night, Jersey Boys played to plenty of empty seats, those over the age of 50 taking up 71% of the occupied cushions. More later. Disregard the calendar, Warner Bros. thinks its early October. In a counterprogramming play that's dubious at best, the folks at 4000 Warner Blvd. 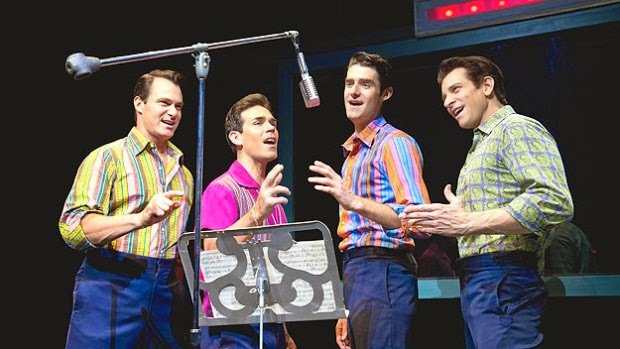 think America – well, old America – wants to see fall fare in the middle of June with this weekend's release of Jersey Boys. While I'm a huge fan of the Broadway show, Clint Eastwood's cinematic adaptation has zero buzz and tepid reviews at best, a fifth-place finish – with roughly one-third the bank of Think Like a Man Too – isn't out of the question. Think Like a Man Too $37.5M (↓) - Kevin Hart's meteoric rise to headliner status gets tested. How to Train Your Dragon 2 $30.5M - Most purely-entertaining film this summer has strong sophomore hold. 22 Jump Street $27M - Even with their A- CinemaScore, feels like word of mouth isn't on Channing & Jonah's side. Jersey Boys $13.5M (↔) - Warners would love a Monuments Men-like bow but will the old fogies show up? Maleficent $12M - Will top $500M worldwide by Sunday, surpassing Mr. & Mrs. Smith as Angelina Jolie's biggest flick. Follow @FinalCutonFilm for updates throughout the weekend.